Throughout the centuries, the nature of God has been at the center of many heated debates. Entire counsels have assembled to discuss whether God is composed of three personalities having one nature, whether Jesus is a part of the Godhead, how the Holy Spirit factors into the equation, and a host of similar questions. The answers to these questions can have far reaching theological and practical consequences. It is the purpose of this article to prove the thesis that the Bible teaches that the Godhead is three personalities—Father, Son, and Holy Spirit—in one nature. As in all discussions dealing with a proper understanding of truth, an agreed upon and acceptable, sufficiently precise definition of the major terms must be set out in the beginning. Godhead or Divinity: A description of the totality, both of nature and personality, of the supernatural Creator of the world (see Lenski, 1961, p. 98). Nature: “The inherent character or basic constitution of a person or thing; essence” (“Nature,” 2015). Personality: A recognizable, distinct entity that has mind and desire. As described by Merriam-Webster: “The complex of characteristics that distinguishes an individual….The totality of an individual’s behavioral and emotional characteristics; a set of distinctive traits and characteristics” (“Personality,” 2015). While most words that will be discussed concerning the Trinity, such as “personality,” “nature,” and even “divinity” or “Godhead,” are fairly easy to define, that does not mean the aspects of God that they describe are easy to understand. In fact, the Godhead is so complex and beyond human capability to fully understand, that any attempt to discuss God quickly reveals the limitations of the human mind. We can never fully understand the Godhead. As the apostle Paul so eloquently wrote about God’s revelation of the Gospel: “Oh, the depth and the riches both of the wisdom and the knowledge of God! How unsearchable are His judgments and His ways past finding out” (Romans 11:33). We should not conclude, however, that nothing can be known of God. Were that the case, to have any discussion about Him, say His name, or even to identify the concept of God, would be impossible for us. On the contrary, while we may not be able to understand fully all that the term “nature” of God entails, and while we may not be able to define the concept of a “personality” so that we comprehend everything about it, we can know enough about the terms “Godhead,” “nature,” and “personality” to say that the Godhead is three personalities in one nature. Premise one: the Bible teaches that the Godhead is one in nature. Premise two: the Bible teaches that God the Father is one personality of the Godhead. Premise three: the Bible teaches that the Holy Spirit is one personality of the Godhead. Premise four: the Bible teaches that Jesus the Son is one personality of the Godhead. Conclusion: Therefore, God is composed of three personalities in one nature. Various Scriptures demonstrate that the Godhead is one in nature. One of the most well-known passages that relates this truth is Deuteronomy 6:4, which states: “Hear, O Israel: The Lord our God, the Lord is one!” A similar passage is found in Ephesians 4:4-6, which reads, “There is one body and one Spirit, just as you were called in one hope of your calling; one Lord, one faith, one baptism; one God and Father of all who is above all, and through all, and in you all.” In addition, Malachi 2:10 says, “Have we not all one Father? Has not one God created us?” The fact that God is one is clearly stated in the Bible. The clear statements of God’s oneness lead some to deny that God is composed of three personalities. They suggest that if God is one, then He cannot be three in any way; so His oneness excludes the possibility that the Father, the Son, and the Holy Spirit are all God. As M. Davies wrote: “We have seen how that, throughout the Bible God is only described as being one being…. So it is to the Bible we must turn, and when we do, we do not find any evidence to suggest that God is made up of three beings” (2009). Thus, the critics of the doctrine of the Trinity do not differentiate between the concept of nature and that of personality. This idea will be expanded upon in the section dealing with common objections. It is included here simply to set up the argument for God’s oneness being in nature, and not personality. The Bible says that “one God” created us (Malachi 2:10). A closer look, however, at the Creation of man shows that some type of multiplicity was involved. Genesis 1:26-27 states, “Then God said, ‘Let Us make man in Our image, according to Our likeness.… So God created man in His own image, in the image of God He created him; male and female He created them.” The Hebrew language used in this passage cannot be definitively used to prove a multiplicity, but it is written in such a way that certainly allows for the one God to have some aspect of multiplicity or plurality. A better understanding of this plurality is gained by looking at the verses in the Bible that discuss the Creation. John 1:1 explains, “In the beginning was the Word, and the Word was with God, and the Word was God. He was in the beginning with God. All things were made through Him, and without Him nothing was made that was made.” Later in the first chapter of John we learn that the Word “became flesh and dwelt among us.” Thus, the Word refers to Jesus, who was with God and was God and created all things along with the Father (John 1:14). We can see, then, that the oneness of the Creator must allow for at least some aspect of God to have a multiplicity of something. In logical form, we could arrange the argument as follows. There is one God who created man. The concept of oneness either means that nothing about God can have any type of plurality, or that some aspect of God is completely unified but at least one other aspect of God can have multiplicity to it. It cannot be the case that nothing about God can have any multiplicity since the Bible gives at least one aspect of God (the Father and the Son) that has multiplicity. Therefore, some aspect of God is completely unified, but at least one aspect of God can have, and has, multiplicity. Once we determine logically that at least one aspect of God has to be “one” and completely unified without multiplicity, we need to identify what that concept is. We see several ideas that are applied to God in His entirety. God is eternal, from everlasting to everlasting (Psalm 90:2; Deuteronomy 33:27). God’s eternality applies to the Father, as well as to God the Son, as is evidenced from the fact that Isaiah 9:6 describes the Messiah (Who is recognized in the New Testament as Jesus) as being called “Everlasting Father.” The concept of eternality equally applies to the Spirit, as the Hebrews writer stated, “How much more shall the blood of Christ, who through the eternal Spirit offered Himself without spot to God” (Hebrews 9:14, emp. added). Since the concept of eternality equally applies to the Father, the Son, and the Holy Spirit, then we have successfully determined at least one aspect of God that is completely unified and applies equally to every aspect of God. Such qualities compose the nature or essence of the being of God. And while it is true that we cannot know or understand all of the aspects of God’s essence, we can compile a list of ideas or attributes that make-up this unified whole that applies equally to the Father, Son, and Holy Spirit. God’s essence is immutable, or unchangeable (Psalm 103:17; Hebrews 13:8). God’s essence is morally perfect (Habakkuk 1:13; 1 Peter 2:22). God’s essence is founded on justice (Psalm 89:14; Matthew 23:23). God’s essence is love (1 John 4:8). God’s essence is eternal (Psalm 90:2; Deuteronomy 33:27; Isaiah 9:6). The Bible provides a much more exhaustive list of the attributes of God’s nature or essence. This short list is provided to make the point that all three personalities of God (i.e., the Father, Son, and Holy Spirit), share one unified nature that applies equally to all of them. Having established the fact that God is one in essence or nature, we can now move to dealing with the idea that God is three personalities. The burden of this portion of the article will be to establish that the three personalities of God are God the Father, God the Son, and God the Holy Spirit. The premise that one personality of the Godhead is the Father is one of the least disputed and easily proven concepts in this discussion. In fact, many people and religious groups consider the Father to be the only personality of God (which we will show is not the case), but very few who accept the Bible as the Word of God argue that God the Father is not God. This is the case because there are so many verses in the Bible that identify God in the personality of the Father. Let us examine a few of those. In 2 Peter 1:17, the text states that Jesus “received from God the Father honor and glory.” Jude 1 is written to those “who are called, sanctified by God the Father.” When Jesus was instructing His disciples to pray, He taught them to say, “Our Father in heaven, hallowed be Your name” (Matthew 6:9). Paul wrote to the Thessalonians, “Now may our God and Father Himself, and our Lord Jesus Christ, direct our way to you” (1 Thessalonians 3:11). As with other aspects of the argument, a much longer list could be compiled showing that the Bible refers to God the Father as being part of the Godhead. Thus, as our argument proceeds, we have now established that the Godhead has one unified nature, and has at least one personality, namely, God the Father. The book of Acts contains a memorable story about two early Christians named Ananias and Sapphira. These two sold a piece of property, gave the money to the church, but lied about the price of the land. When the apostle Peter rebuked them for their sin, he said, “Ananias, why has Satan filled your heart to lie to the Holy Spirit.... You have not lied to men but to God” (Acts 5:3-4). Notice that Peter stated that by lying to the Holy Spirit, Ananias had lied to God, equating God and the Holy Spirit. In addition, 1 Peter 1:2 says that the Christians there had participated in the “sanctification of the Spirit.” In 2 Thessalonians 5:23, the Bible says, “Now may the God of peace Himself sanctify you completely.” Again, we see that the work of sanctifying the Christian is accomplished by God, but is attributed to the Holy Spirit. This line of reasoning can be extended to other aspects of God’s action. In 2 Timothy, Paul states that “All Scripture is given by inspiration of God” (3:16). Peter explains that the Scriptures were produced when “holy men of God spoke as they were moved by the Holy Spirit” (2 Peter 1:21). We then can reason that God inspired the Scriptures, and the Holy Spirit inspired the Scriptures, thus the Holy Spirit is God. Once we establish that the Holy Spirit is God, we next need to show that He is a person, not simply a nebulous force. We have defined the word “person” as a recognizable, distinct entity that has mind and desire. The Bible paints a consistent picture that the Holy Spirit, like the Father, is a person. First, the Scriptures state that the Holy Spirit can, and has, talked to people using language that those people can understand. In Acts 8:29, we read that “the Spirit said to Philip, ‘Go near and overtake this chariot.’” This was not a nebulous, impersonal force, but a recognizable voice used by a person to communicate His desire to a man named Philip. The apostle Paul explained that “the Spirit expressly says that in later times some will depart from the faith” (1 Timothy 4:1). Once again, the Spirit speaks in understandable language. In Revelation, the text says that “the Spirit and the bride say ‘Come!’” (22:17). Only a person with a will and identity could offer such an invitation. In addition, consider that the Holy Spirit can be blasphemed (Matthew 12:31-32), lied to (Acts 5:3), insulted or despised (Hebrews 10:29), and grieved (Ephesians 4:30) (Olbright, 1999, p. 25). The Holy Spirit is God, and has all the traits of a person. We therefore conclude that the Father is one personality of God, and the Holy Spirit is another personality of God, proving that the one God has a multiplicity of personalities. The prophet Isaiah predicted that the Messiah would come in the form of a Child. That Messiah was going to be known as “Wonderful Counselor, Mighty God, Everlasting Father, Prince of Peace” (Isaiah 9:6). Notice specifically that the coming Child would be called Mighty God. In the New Testament, we see that Jesus was that Child, the anointed Messiah, the Son of David described in Isaiah 9:6. In John 4:25, the woman with whom Jesus talked at the well stated, “I know the Messiah is coming” to which Jesus responded, “I who speak to you am He” (John 4:26). When we put the premises together, the argument looks like this: The Messiah is Mighty God. Jesus Christ the Son of God is the Messiah. Therefore, Jesus Christ is Mighty God. In the first chapter of John, the text says, “In the beginning was the Word, and the Word was with God, and the Word was God” (John 1:1). Again, notice that the Word is called God. Just a few verses later, the text explains that the “Word became flesh and dwelt among us” and that John “testified of Him” (John 1:14-15). In John 3:22-36, the person John testified about is Jesus Christ the Son of God. Putting the pieces together, we arrive at the following argument: The Word is God. Jesus Christ the Son is the Word. Therefore, Jesus Christ the Son is God. The apostle Thomas added his voice to this conclusion when he saw the wounds in Jesus’ body and proclaimed to Jesus, “My Lord and my God!” (John 20:28). Matthew wrote a detailed account of Jesus being tempted by the devil in the wilderness. During that temptation, the devil enticed Jesus to fall down and worship him. Jesus responded by saying, “It is written, ‘You shall worship the Lord your God, and Him only you shall serve’” (Matthew 4:1). Jesus’ argument went as follows: All people are morally bound to worship only one being, that is, God. The devil is not God. Therefore, no one should ever worship the devil. From this line of reasoning, it is clear that anyone who is faithful to God will not encourage the worship of any being other than God. We see this truth played out in a number of episodes in the Bible. In Acts 14, Paul and Barnabas were in the city of Lystra when they healed a crippled man. The residents of the city were so enamored with the two, they began to worship them. Paul and Barnabas rushed in among the crowd and tried to stop their worship, crying out, “Men, why are you doing these things? We are also men with the same nature as you” (Acts 14:15). Their argument was similar to the one Jesus made. All people are morally bound to worship only one Being, that is, God. Paul and Barnabas are not God. Therefore, no people should ever worship Paul and Barnabas. The same thought process is used in Revelation 22:6-9. In that passage, the apostle John is introduced to an angel. The apostle “fell down to worship before the feet of the angel” (Revelation 22:8), but the angel said to him, “See that you do not do that. For I am your fellow servant…. Worship God” (Revelation 22:9). The angel’s argument can be laid out in the following way. God is the only Being any person should worship. I, an angel, am not God. Therefore, no person should ever worship me. When we consider how Jesus responded to being worshiped, we can see that He readily accepted it as a proper response to His personality and power. On numerous occasions, the Bible records that people worshiped Jesus Christ. Matthew 14:33 says that his disciples “came and worshiped Him, saying, ‘Truly You are the Son of God.’” Jesus accepted the worship and did not rebuke them. In John 9:38, Jesus healed a man who had been born blind. Jesus then instructed the man to believe in the Son of God. The man responded by saying, “Lord, I believe!” then the text says, “And he worshiped Him” (see also Matthew 2:11; 28:9; John 20:28). As we analyze this argument, we see that Jesus said all people are morally bound to worship only God, and Jesus accepted worship as the proper attitude of people toward Him. Either Jesus violated Scripture and accepted worship contrary to the Bible’s teaching, or Jesus is God. Jesus never violated Scripture (Hebrews 4:15; John 8:46). Therefore, Jesus is God. In the Hebrew Bible the special name for God is called the Tetragrammaton. It is composed of four Hebrew letters and is transliterated Jehovah or Yahweh. The actual pronunciation of the name has been lost since the original Hebrew did not have vowels. This name is used only to describe the eternal Creator God of the Universe. In Isaiah 6, the prophet records a time when he saw God in a vision. The angelic beings who stood around God’s throne addressed God as “Jehovah” of hosts in Isaiah 6:3 and used the same name (the Tetragrammaton) in verse five. There is no doubt that Isaiah was describing a vision of the eternal God. When we turn to the New Testament, we see the apostle John describing this scene from Isaiah. John writes that although He (Jesus) “had done so many signs before them, they did not believe” (John 12:38). He then references Isaiah 6:9-10, and says, “These things Isaiah said when he saw His glory and spoke of Him” (John 12:41). The fact that the pronoun “Him” in verse 41 is referring to Jesus is verified by the use of the pronoun to describe Jesus in verse 37 and verse 42. Thus, the argument can then be made as follows: Isaiah saw the glory of Jehovah God in Isaiah 6. John says that Isaiah saw the glory of Jesus and references the episode in Isaiah 6. Thus, John equates Jesus with Jehovah. Additionally, other passages reference Jesus as being Jehovah. Isaiah 40:3 explains that a messenger would be sent as the forerunner of the Messiah. This messenger would be “the voice of one crying in the wilderness” who would “prepare the way of the Lord (Jehovah); make straight in the desert a highway for our God” (Isaiah 40:3). The New Testament applies this prophecy to John the Baptizer (John 1:11) and declares that John prepared the way for Jesus, thus equating Jesus with Jehovah. Again, the argument is as follows: Isaiah said the messenger would prepare the way for Jehovah. John was the messenger Isaiah predicted. He prepared the way for Jesus. Thus, Jesus is equated with Jehovah. From these passages and the arguments they present, the Bible student is drawn to a concrete conclusion about Jesus the Son. Not only is Jesus directly called God, He accepted worship that is reserved only for God, and the holy name of Jehovah is applied to Jesus; thus Jesus is God. The idea that Jesus is a person who has a personality is undisputed. Therefore, Jesus is one personality of the Godhead [NOTE: For more information on the deity of Christ, see Miller, 2005 and the entire section of the Apologetics Press Web site dedicated to that topic under the heading “Deity of Christ” at http://apologeticspress.org/APContent.aspx?category=10.] We have now established that the Father, the Holy Spirit, and the Son are three personalities of the Godhead, and they are composed of one nature. Let us turn to some common objections to this conclusion. As with any subject pertaining to God and the Bible, an exhaustive list of objections and responses to them would be so extensive it would take hundreds or thousands of pages to complete. With that in mind, we will have to content ourselves with responses to a few of the more common objections to the thesis we have presented. But did you realize that, even though it is a common assumption among many sincere religious people, the word Trinity does not appear anywhere in the Bible? In fact, the word Trinity did not come into common use as a religious term until centuries after the last books of the Bible were completed—long after the apostles of Christ were gone from the scene! (“Is the Trinity...?” 2011, italics in orig.). Supposedly, because the Bible does not use the term Trinity to describe God, then the idea of a Trinity is an extrabiblical idea that was forced into the text. In truth, the objection that the term Trinity is not used in the Bible can be refuted by showing that there certainly are words used today that describe concepts in the Bible, but those words or terms are not in the text. For instance, the Bible never uses the term “atheist” or “atheism.” Can we argue from that fact that the Bible does not deal with the concept of a person who does not believe in God? No, since we can see that Psalm 14:1 states, “The fool has said in his heart, ‘There is no God.’” Our modern term “atheism” accurately describes a person who says, “There is no God,” even though the term is not used in the text. In addition, the Bible never uses the word “Sunday,” yet we use that word today to accurately describe the day the Bible calls “the first day of the week,” which came after the Sabbath. Incidentally, we use the word “Saturday” to describe the Sabbath, even though “Saturday” is never used in the Bible. These examples show the logical inconsistency of claiming that a concept is not taught in the Bible if the word we currently use to describe the concept is not in the Bible. Another often heard objection to the thesis is the idea that if God is one, there is no way that He can be three. Those who use this argument quote verses such as Deuteronomy 6:4, “The Lord our God, the Lord is one!” and Ephesians 4:6 which says there is “one God and Father of all.” They argue that if God is one, as these verses say, then He cannot be three at the same time, because this would be a violation of the law of logic known as the Law of Contradiction. In responding to this argument, it is helpful to review what the Law of Contradiction actually says. Warren states the law as: “Nothing can both have and not have a given characteristic (or property) in precisely the same respect” (1982, p. 23). Another way to state the law is that nothing can both be something, and not be that same thing at the same time, in the same way. The pertinent aspect of the Law of Contradiction as it relates to the Trinity discussion is the idea of a person or thing having a certain characteristic “in precisely the same respect” or “in the same way.” For instance, we could say that a person named Bob is very rich and very poor. While it seems contradictory at first, we could mean that he is physically and financially prosperous, but he is very shallow and spiritually poor. So, in one sense he is rich (monetarily) and in another sense he is poor (spiritually). Therefore, it can be true that he is both rich and poor at one and the same time. In the same way, God can both be one and be three at the same time precisely because the terms “one” and “three” apply to different aspects of God. When we use the word “one” we are discussing God’s eternal nature or essence. When we use the word “three” we are describing the personalities of God, not His nature. Thus, it is important to understand that the Godhead is three personalities in one nature. This statement does not violate the Law of Contradiction and accords with what the Bible says. A discussion of the nature and personalities of God is important for several reasons. First, if God includes information about Him in the Bible, then He must want humans to study and learn that information. Second, a misunderstanding of God’s personalities could result in a spiritually catastrophic conclusion that is at odds with God’s Word. If a person misunderstands that Jesus is the eternal God on par with the Father and Spirit, that person may never grasp the significance of the fact that God in the flesh came to Earth to die for his or her sins. Such a misunderstanding may also cause that person to fail to honor Christ as the Bible commands. Jesus stated “that all should honor the Son just as they honor the Father. He who does not honor the Son does not honor the Father who sent Him” (John 5:23). Only if a person understands that the Son is God just as the Father is God can that person honor the Son “just as” he or she honors the Father. Thus, a discussion of the Trinity is necessary to sound Christian doctrine and practice. If a person approaches the sum of Scripture motivated by an earnest desire to know the truth about the Godhead, that person can, with complete confidence, infer from the biblical premises and implications that the Godhead is three personalities—the Father, Son, and Holy Spirit—in one nature. 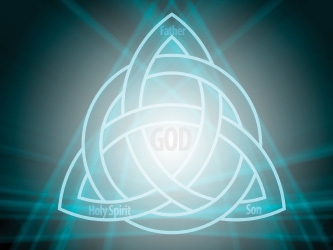 Davies, Matt (2009), “God—A Single Entity and Not a Trinity,” The Gospel Truth, http://www.the-gospel-truth.info/bible-teachings/god-unity-or-trinity/. “Is the Trinity Biblical?” (2011), United Church of God, http://www.ucg.org/bible-study-tools/booklets/is-god-a-trinity/is-the-trinity-biblical. Lenski, R.C.H. (1961 reprint), The Interpretation of St. Paul’s Epistle to the Romans (Minneapolis, MN: Augsburg). Lyons, Eric (2006), “Answering Christ’s Critics,” Apologetics Press, http://www.apologeticspress.org/APContent.aspx?category=6&article=578&topic=71. Miller, Dave (2005), “Jesus’ Claims to Deity,” Apologetics Press, https://apologeticspress.org/apcontent.aspx?category=10&article=2465. Olbright, Owen (1999), The Holy Spirit: Person and Work (Delight, AR: Gospel Light). Pearce, Fred (no date),“Jesus: God the Son or the Son of God? Does the Bible Teach the Trinity?” http://www.christadelphia.org/pamphlet/jesus.htm. Warren, Thomas B. (1982), Logic and the Bible (Ramer, TN: National Christian Press).